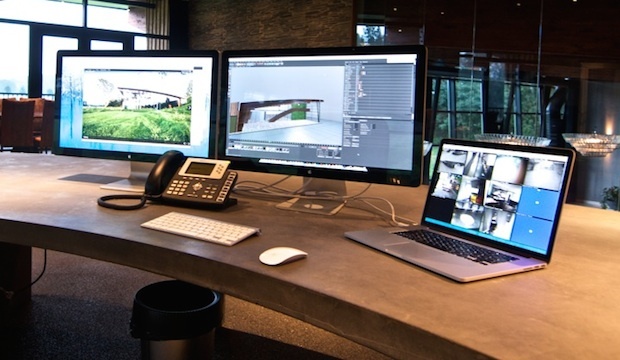 We feature a wide range of Mac setups here, but this one is particularly stunning and may be one of the most amazing workstations we’ve covered yet. 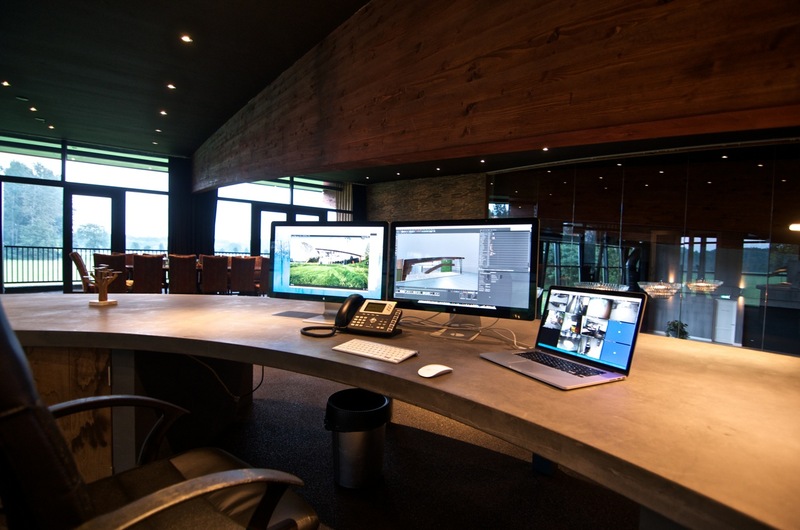 From top-of-the-line Apple hardware, an entire custom designed building and office, to the whopping 65′ x 16′ projection screen (yes, that is measured as FEET, not inches) displaying content from an Apple TV, this workstation absolutely must be seen. You can click on any picture to see a larger version, and we’ve even got two videos that demonstrate the construction of the building, and another which shows off the enormous projection screen in action. Don’t miss this! What do you do, and what hardware is part of your great Mac setup? I’m a real Apple fanatic, I could definitely cover my desk with Apple stuff but I prefer to have a clean workstation. What are some of your most used apps? The software I use regularly includes Cinema 4D, the complete Adobe package, AutoCAD, and Sketchbook Pro. Can you tell us a bit about this amazing office? This is my dream office, my brother and I designed and made the building. 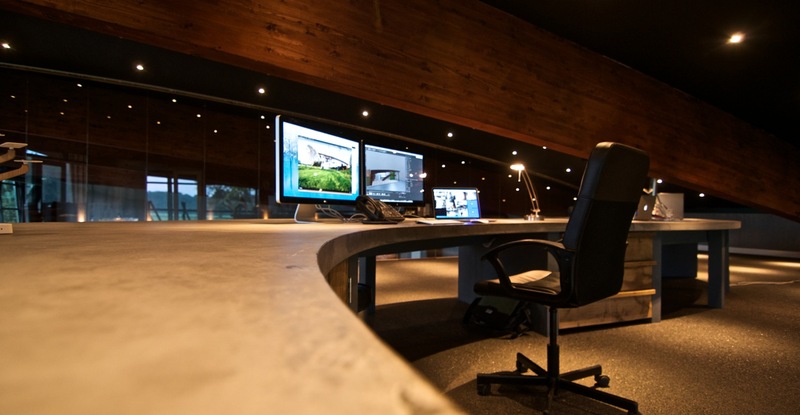 Everything is custom designed, including the 3500kg (7700lbs) concrete desk with heating integrated into the surface. I can manage the entire Domotica automation system of the entire building right from my desk, including a 20 meter wide retractable projection screen. Every presentation is controlled through Apple TV and AirPlay. There are many solutions available for presentations, but even the most expensive ones don’t compare to the problem-free Apple TV. 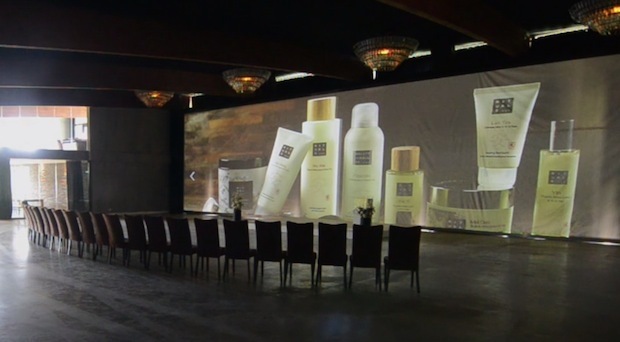 The following two movies give a further overview of the office, including a time-lapse of the building being constructed, and a demonstration of the retractable projection screen and how the domotic system adjust curtains, lighting, and the screen itself. Do you have a great Mac setup you want to share with OSXDaily? Go here to get started, all it takes is answering a couple of questions, taking a few good pictures, and sending it on in! You can always browse through our previously featured Mac setups too, they’re all pretty great. Wow! Mac setup? Office??? Heck, I would live in that as my HOUSE! 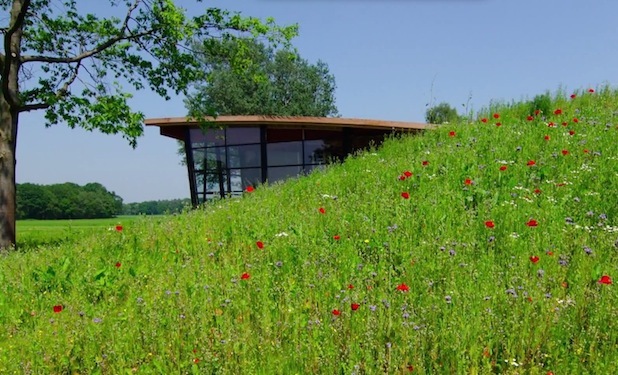 I love that it has been built into a hillside too. I imagine it’d be costly to build such a thing, but that really would make for an incredible home. Oh and great Apple gear too, dual 27″ thunderbolts is always a winning combination. I hope that Apple comes out with a Retina Thunderbolt display soon. I stay scothed on the time lapse Building contruction, realy impressive ! what games can you play on that system? Your projection screen has wrinkles in it. what projector(s) is used in this application?